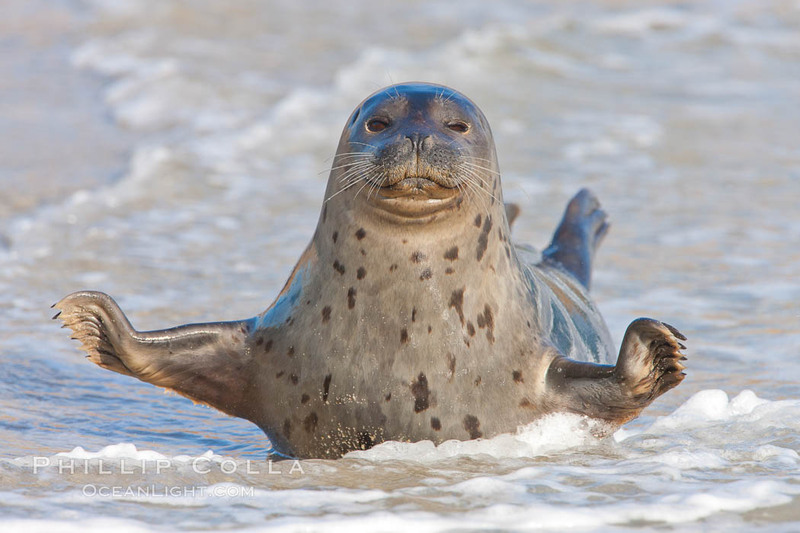 Cute Harbor Seal Photo, La Jolla, California. This is one of the famous or, depending on your political position, notorious Pacific harbor seals (Phoca vitulina richardsi) the reside at the Children’s Pool in La Jolla, California. Some people really hate these seals and feel their presence on the beach has robbed people of the use of small cove and want to see the seals gone, forcefully or otherwise. Others love the seals and don’t want to see them bothered at all. I don’t really care either way, I just like to shoot photos of them. I’ve been photographing (and diving with) these seals since their colony first began forming in the ’90s. There are certain times of day when the light angles and water movement really work well here for photography. On this day, one of the more charismatic seals was moving about at the water’s edge and paused for a moment with its flippers raised, looking at me. I got off a series of photos and this was the most appealing of the group. Pacific harbor seal, an sand at the edge of the sea. * I was fortunate to have three of my photographs receive Highly Honored recognition in this years Windland Smith Rice photography competition sponsored by Nature’s Best Photography. The first was a photo of photographer Garry McCarthy working in the Virgin River Narrows in Zion National Park. The second was a composition of the Giants Marbles in Joshua Tree National Park. 21,000 images were entered in the competition, 500 made it to the final round of judging and 131 were winners or highly honored and appeared in the most recent issue of Nature’s Best Photography magazine. I am crossing my fingers that one of mine will also be featured as part of the competition’s six-month exhibition next year at the Smithsonian Museum of Natural History in Washington D.C.